EVE Valkyrie launched into full early access this Monday in sync with the much-anticipated Oculus Rift hardware commencing shipping. Due to incredibly heavy demand, some purchasers may find themselves waiting until July to see the backlog of pre-orders fulfilled. Having launched with the Rift, Valkyrie will enjoy a steady stream of freshly equipped new players rather than the deluge and accompanying server woes that come with an international launch to an eager audience. A full review of a primarily multiplayer game in early access necessitates both time and a healthy player population to be fairly evaluated, while as a VR title, Valkyrie deserves to be judged on consumer hardware. As such, a proper and fair review may be some time coming. 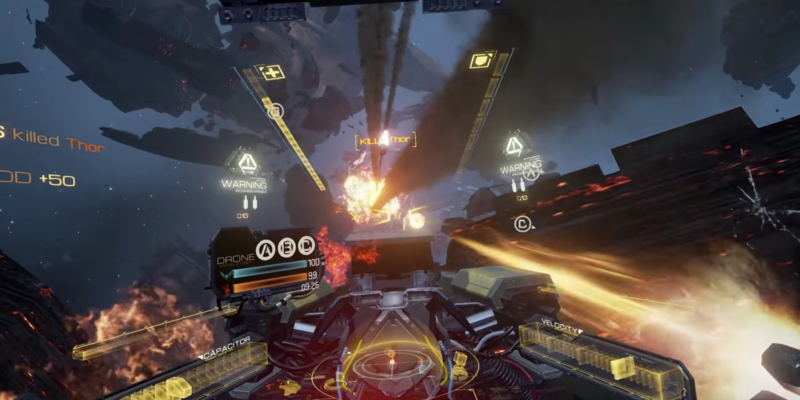 Yet a core group of eager pilots, either lucky enough to get an early delivery or slumming it with a developer kit, with lessons learnt from the alpha test, are on Twitch.tv streaming their forays into the new release. We went out and talked to some of them to get an idea of who these people are. 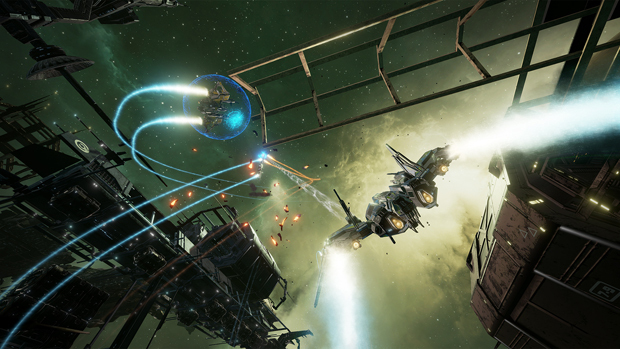 What attracted you to EVE: Valkyrie? 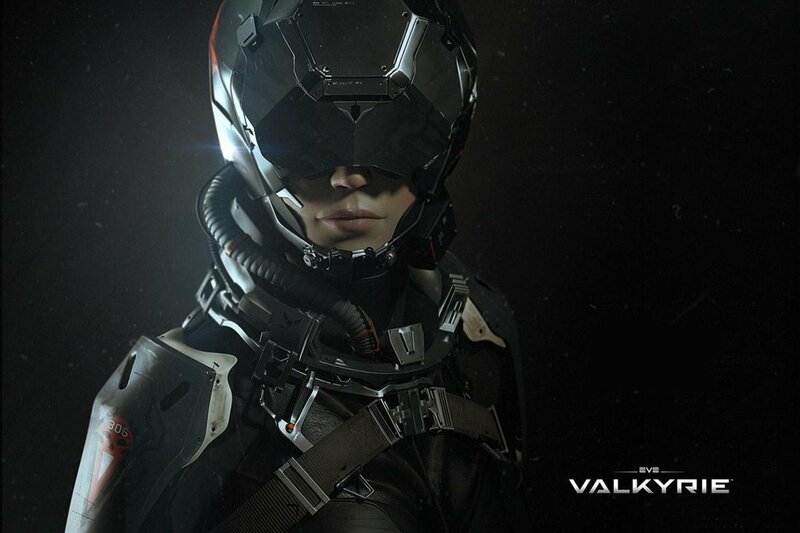 I was drawn to Valkyrie by pure chance – it was at Fanfest 2015, which I went to on a whim having been invited to go by a friend (Drechlas) who plays EVE Online a lot more than I do… “I got a spare room” like two weeks before, went, found Valkyrie, amazing game. It’s FreeSpace for the twenty-teens! I play EVE a little… very little, but I know the universe and some of the people. Have you produced content for other games? I’ve helped make fan content for FreeSpace open; my YouTube is literally full with mod campaigns from there! Twitch-wise, I streamed a fair few games now, most recently Witcher 3, but Freespace, the Binding of Isaac, and others. What is unique about your stream? My stream isn’t that unique honestly, not naive enough to think it is, I’m just another guy making noise about computer games, I love ’em and have had some great people in my chat to talk to about them. The only unique thing I can really offer is, for some games, I’m pretty good! My favourite ship is undoubtedly the Dominator. I want to enjoy all the other ships but that one is my main, at least at the moment. What are you expecting from or hoping for with Valkyrie? I played EVE for years… years! Dominix 10 drone = best Domi. Currently my character is on the shelf mainly because my friends moved on and it can take a longer time investment compared to, say, Valkyrie. My char’s name was Mr Noah. Yes, I’ve had the honor of helping out with other releases and hosting events for Grinding Gear Games, Stardock Games, Firaxis, and now CCP. My YouTube channel has a mess of things… really whatever comes to mind. SlippingSand is my Twitch name but I think I’m lovingly known in EVE:VR as Sand Support (trademarked!). I think the unique thing about my stream is that it’s just a guy having fun when life gives him a break. I’m not doing it for a living, I’m doing it just to have fun with the folks who watch. For EVE:VR, I only fly support and we have a blast when folks play together. Sometimes we’ll get some developers hanging out with us to answer questions. By far, the support ship… and hell if I can remember but I think it’s called the Legion? It’s a Banshee with counter-measures, with the buffs being better able to drain shields from enemies to heal yourself. 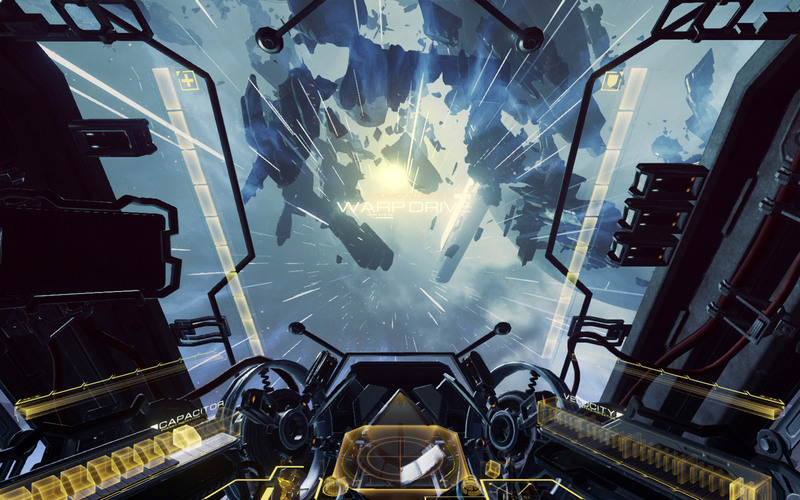 I’d love to see EVE:VR turn into a competitive eSport; this game is the perfect vehicle for crowd engaging battles, casters screaming at close calls, and seeing the mayhem and artwork of top notch pilots. Better yet, they don’t need a twenty minute explanation for a new fan (sorry Dota, I love you!) because everyone knows the dream of flying a starship. I’m wan5, Valkyrie player and streamer. The first trailer for EVE VR; even back then the idea of a fast paced space dog fighter game was appealing and obviously the fact that it was VR. It seemed to check all the boxes from the get go. It also appeals to the sci-fi fan within; who hasn’t wanted to be shot out of a launch tube? I don’t, I tried it a few years back but it’s something I don’t have the attention span for. I like the art and the lore, I’m just more into instant gratification. A couple of YouTube clips maybe years back but nothing like Twitch streaming, it’s all really new to me. I always try to throw a bit of humour in there, but it’s also ideal for new players to come and watch someone with some of those “classified” ships so you know what you’re playing against. The stream usually also will show squad game play which is a different game to lone-wolfing it. So far, the Dominator, but i still have a lot to unlock! I loved the Elis 3 map, i think that’s what it’s called. I’d love to see more battles like that, especially with multiplayer support. I would also love to see some form of permanent squadding or clans in the game. Back in 2012 I specifically made plans to attend the 10th Fanfest or 10th Year Anniversary (whichever one it was) to be hosted in 2013. I knew this would be a year of big announcements but I had no idea that Oculus would be involved. It was tough getting time in at Fanfest on E:VR as I was on a contender for EVE Universe Tournament involving Dust and EVE Online, but I still managed to get several runs in. One of our buddies went over 40 times. Play? That’s such a loaded word in this universe… Short answer is yes, I subscribe. Outside of EVE I am a hard-at-work Systems Administrator and a father of two very young clones. I started my first foray into EVE Online in the Fall of 2006 with a couple of characters that ended up getting biomassed. In April 2007, after getting ganked in highsec I readjusted my attitude toward the game and created ‘a newbie’ as a slight against anyone I managed to kill and to adequately and simply ‘autofill’ the checkboxes of what mistakes I made that got me killed: “I’m a newbie, therefore I died making newbish mistakes”. I generally had a lot of free time to play for several years but that time was soaked up once I started toiling away behind the firewall. Now I login to research blueprints, flip skills, and maybe, just maybe, sync up with my alliance for some fights. I used to be a volunteer for Ultima Online a long time ago, talking about adding another decade on top of my EVE life, but that was a volunteer staffing position for Chesapeake server. My biggest contribution to a game probably would be from back in the days when I was #1 for several months on NovaLogic’s stat boards for CQB on Delta Force (Original). I ended up forming a clan (Disorganized Crime Unit / DCU) that went on to produce some of the most popular community maps. Through rigorous playtesting and a well-thought out balance of mayhem and endless engagement, I could liken it today to that of COD being released back in late late 90’s. Outside of that, most of my contributions tend to be related to services and content for whatever player organization I can offer my technical and artistic services to. Well, I guess the shortest answer is myself. I don’t have much to engage with other than myself. It is a bit difficult to have a one-sided conversation with yourself when you don’t have a following and already have a tough time engaging new viewers due to the Oculus on, so often I end up sitting there with my mouth agape looking like I just had a stroke hoping for a sub while I make a fool out of myself. I will on occasion have my sons on stream for fun or give the viewers the unfiltered perspective and wonder of a child experiencing VR or a new VR game for the first time. I can have a little bit of a foul mouth and I tend to not be offensive towards others unless you’re talking about drivers in Massachusetts, then all bets are off. I find myself interesting; if I can at least say that, you could come to watch an uninteresting adult gamer flop around in his chair like a fish as a showcase of VR. By far and large the Wraith. This is the only ship that to me immediately feels like your trusty-never-fails shitbox car you’ve lived, loved, and lost. I don’t mean to imply that this thing is assembled from spare parts from your Uncle Joe’s Chop Shop but rather a car that you’ve used for so long you intricately know its behavior and capabilities inside and out, including that trick you found to avoiding to have to replace a $300 Engine Control Module (ECM). You had to ask this one, huh? I expect nothing from Valkyrie. What I had long ago expected to see had already been delivered and surpassed during the Alpha and Pre-Alpha tests. What I am hoping for on the other hand, is a long and prosperous future. Already my son (~4yo) refers to Valkyrie as ‘spaceships’. Much as Counter-Strike can be found heavily used even for versions well over 10 years old, I hope that my son can vent my carcass into space with me screaming and hollering at him about the use of hacks. He was only a button masher back then but he’s already scored a kill on EVE at 9 months and, shortly after Dust was released on PS3, he got some poor sap with the old school martyrdom tactic of grenade tossing at your own feet. Now he has a whole new game to show me up in. As technology advances and VR may progress into dive-like systems, my kids can look back at this as my pebble in the pond. I didn’t dig it, I didn’t fill it, and I may not have swam in it, but the feedback from Alpha phases and the interest us streamers are attempting to generate for it will have caused the ripples that became the tsunami that is VR. There may not be many complete games for VR yet, but it has already launched with more titles than most original consoles of the progeny you see today. The work that Lucky has done to spin the wheels of the industry have brought us into a completely new era. Some day in the future, I hope we all can look back on today for the new generations as the day when Atari or Nintendo came out, the fondness of holding the golden cartridge to Zelda in your hands, the smell of new plastic and the feel of the controls. Ok, maybe not the smell of plastic, but when you put on Oculus and fire up the Retro Arcade your mind is already playing tricks isn’t it? Stanky old carpets, smell of wax on your hand from Ski-ball, the muscle memory of your fingers wrapped around the button on your favorite pin-ball machine. I remember how shattering of player perceptions games like Tie Fighter, Descent, Freelancer, Freespace, and Wing Commander were among the communities. Every time a new one came out, we somehow felt like “we’re so close” to feeling like we’re immersed. Right now I have a hard time focusing because I find myself wanting to scrape the frost off the inside of my cockpit or trying to read the super tiny terminal output screens that are not meant to be read. However great those games are though, they have since passed on to the platform graveyard and live on under die hard enthusiasts (I’m looking at you QuantumDelta, in case you missed it). Maybe I am expecting more than hoping, wanting to see Valkyrie in for the long haul. I hope the community can keep this game going for years, but I quickly see VR becoming a race to more immersive dive-type systems allowing our mind to fill in the blanks on our surroundings and reduce the input needed from devs. Whatever happens outside my own little world of hopes and dreams, I expect Valkyrie to be at the forefront for years to come.